Billy Bragg has never hid his passion for the great American roots songbook. His work on advancing the legacy of Woody Guthrie is well noted and the latest studio album from the Bard of Barking adopted a very Americana feel. For this new project Billy has once again teamed up with the producer of TOOTH AND NAIL, but this time the credits are shared with Joe Henry as the pair embarks on a journey celebrating the history of the American railroad and its influence at the onset of rock ‘n’ roll. The result is a collection of field recordings with a difference and an intriguing take on a bunch of songs framed by their familiarity and iconic status. Basically SHINE A LIGHT: FIELD RECORDINGS FROM THE GREAT AMERICAN RAILROAD is an explicitly simple title introducing thirteen railroad themed songs recorded live on a train journey from Chicago to Los Angeles. The bare outtakes complete with the backing track of a real life station presents each song in its most desired and appropriate form. As you would expect musically, the acoustic guitar reigns supreme with a little harmonica help, while vocally there is a stark contrast between Joe’s bluesy rasp and Billy’s deadpan delivery; a case of southern England meets southern USA. The light touch and sparse production is what each of these songs warrants as they breathe the life of a thousand stories, crowning the impact that the railroad had on song writing, mainly in an expansive age. Perhaps the surprise inclusion is a version of the John Hartford penned Grammy winning standard classic ‘Gentle on My Mind’. Although its free spirited feel is akin to the effect the railroad had when it was the dominating means of travelling the vast distances of a wide continent. This version dominated vocally by Joe, surfaces as a credible addition to the vaults of its recordings and nestles neatly on an album dedicated to celebrating the longevity of the travelling song. The good news is that the duo are teaming up for some UK shows to share the songs, quite an achievement relating to Billy’s never ending commitment to touring his own material and Joe’s forever in demand status as one of America’s leading producers. The planned evenings should be quite special and the perfect accompaniment to the recordings that adorn this valued CD. Many folks will be familiar with a bulk of the tracks as the work of Lead Belly, Hank Williams, Carter Family and Jimmie Rodgers amongst others is heralded. The question may be asked ‘do we need another version of ‘The Midnight Special’, ‘Waiting for a Train’, ‘The L&N Don’t Stop Here Anymore’, ‘Lonesome Whistle’ and ‘In the Pines’? Without any doubt, the answer in this collectable format is yes and there is always a new audience to be gathered, with Joe and Billy just being temporary custodians and disciples. Maybe the most interesting inclusion on the record is a cut of Gordon Lightfoot’s ‘Early Morning Rain’, perfectly aligning the feeling of settling for the railroad when the excitement of air travel is tantalisingly out of reach. This track brings the album to a suitable close, around forty minutes after Billy had led off with his shared passion for the legacy of Lonnie Donegan and a celebratory version of his 1956 hit ‘Rock Island Line’. This project has been an unequivocal labour of love and each discerning attentive listener is willingly displaced to a time in history heavily frequented by musical romanticists. SHINE A LIGHT: FIELD RECORDINGS FROM THE GREAT AMERICAN RAILROAD works with undoubted ease whilst showcasing the ultra-commitment of its two protagonists. 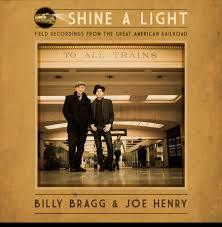 Billy Bragg and Joe Henry have made great music in the past and will continue to do so in the future. Indulging in their present is worthy of your valued time.